Usually, red-backs are very common around Castlemaine. They're pretty common all over the east coast of Australia. Usually. But not this year. My arachnid guru, Alan Henderson, needs some redbacks for a film commission and put out a call because no-one could find them. Not one, not anywhere. 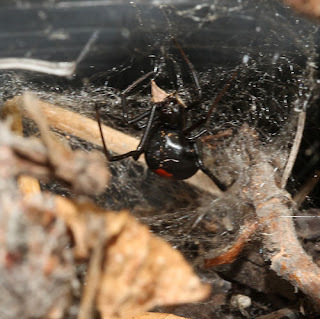 A member of the tangle-web Theridiidae family, the redbacks (Latrodectus hasselti) are closely related to the American black widow (Latrodectus mactans). I had all but given up on finding redbacks for Alan when I was tidying some pot plants for an elderly neighbour, Nina. There was a most unusual web in one of the pots. It was a funnelled web, shiny, like that of the theridiids, but with a distinctive funnel, which is not their usual style at all. I took my new spider home and named her Arachnina after my neighbour. 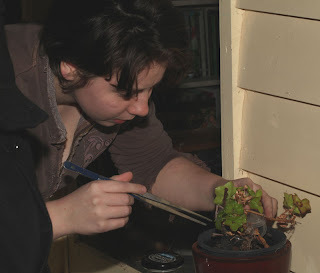 That night I shone the torch on the owner, and there was no doubt that she was a redback. 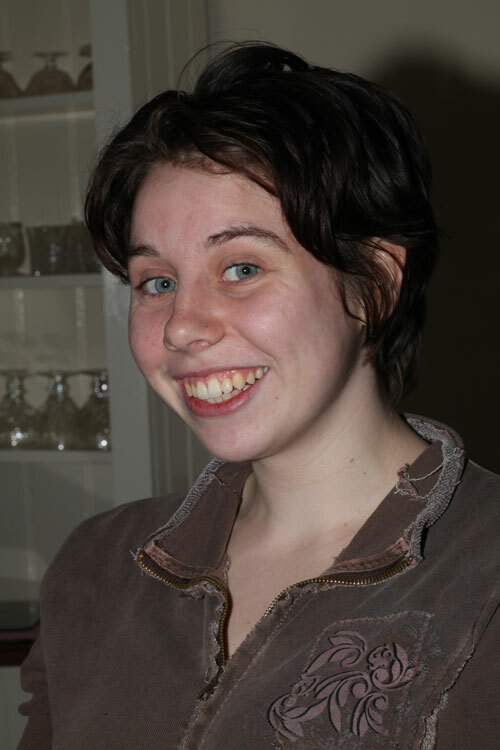 Alan's daughter, Caitlin, came from near Melbourne to collect Arachnina. This is a rare image of a Reback Wrangler at work. Arachnina was collected into a container, with her web and retreat, ready to make her trip to Queensland to become a film star. Meanwhile, one of the many scouts I had out looking for redbacks had turned up with an understudy, rather unceremoniously enclosed in a jam jar. 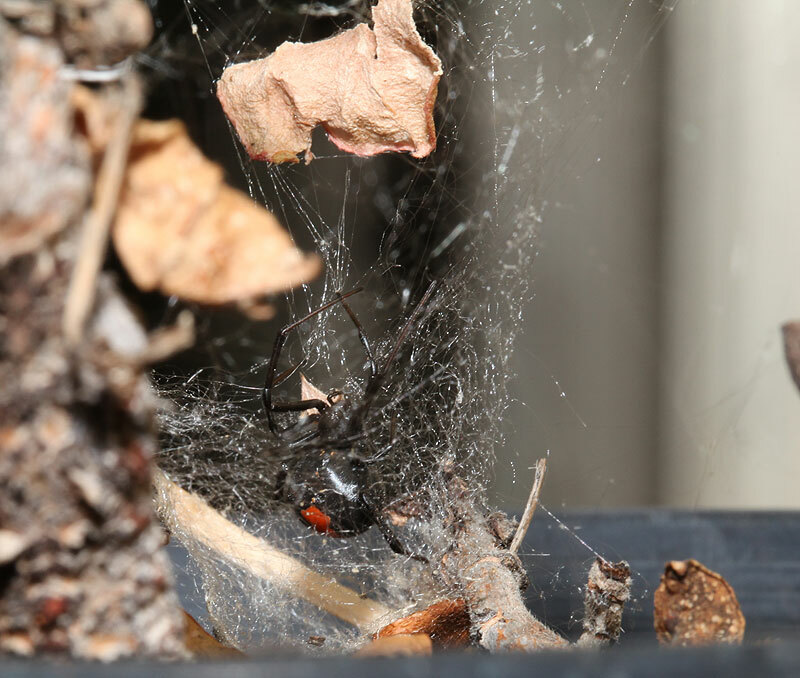 The Redback Wrangler made our new spider more comfortable with twigs and leaves. The understudy soon started spinning herself into a safe retreat. Soon after Caitlin had left, I received a phone call from another scout. 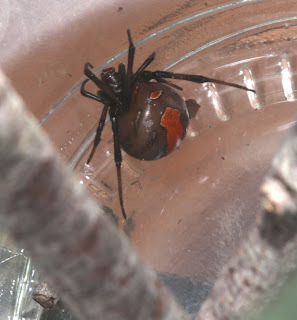 A third redback had been located. Having received detailed instructions from Alan in addition to having watched Caitlin, I venture forth tomorrow - I get to be The Redback Wrangler. Watch this space - Alan has promised a really good photo of Arachnina. A good photographer can make a film star look stunning. I let you know about her starring role when it is public knowledge. I know you are all intrigued to know what the partner of a Redback Wrangler eats. Admit it, you have always wondered. Here is the evidence of the shocking truth. 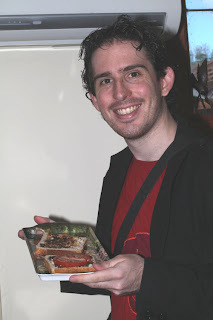 Adam had a sandwich of thick vegemite, tomato and lots of pepper on wholemeal. I kid you not! Spider Wrangling is the perfect job for folks like us, unfortunately, there isn't a lot of call for it. :^) Great story. I wrangled a redback! I must admit I got it a little easier than Caitlin. Well, a lot easier. She had her web in an egg carton in a shed. So all I had to do was put the egg carton in a plastic bag, make some holes and follow instructions from Alan and Caitlin on packing and posting it. But as I retell my Redback Wrangling story over the years, the carton will disappear, the size of the spider will grow and her docile demeanour will grow an aggressive streak. Now lets see if the three gorgeous critters make it safely to The Chief Wrangler in Queensland. Must admit that the peacock spiders are the lookers of the arachnid world. But the film is about myths, to the best of my knowledge - I'm not involved. Maybe you and I can create a myth about the peacock spiders, so they can be in it too? The FIlms Star, Arachnina, and her two understudies, are now all safe in the hands of the Chief Spider Wranglers, Alan and Deanna Henderson, at Minibeast Wildlife. Watch this space for Fan Club updates on the flourishing career of Arachnina!